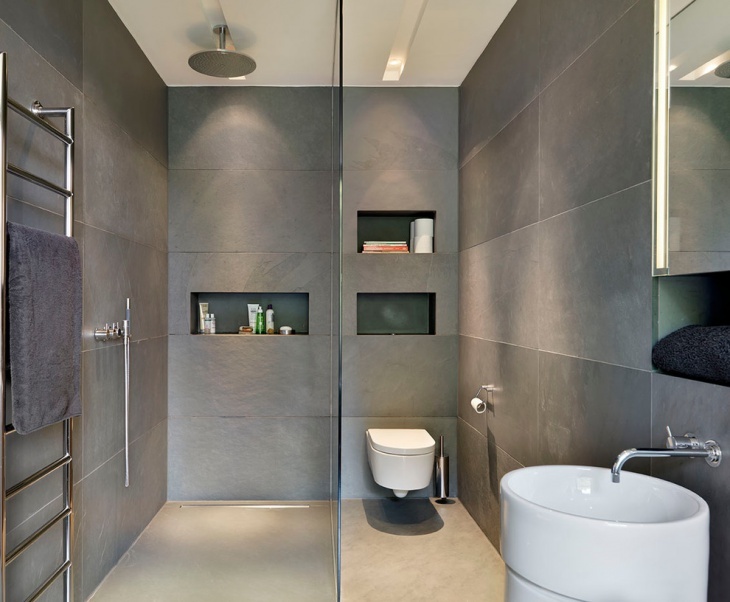 Love an open shower design? Well, the experience is really exotic, but comes with a maintenance threat. Architects; however seemed to have found a mid way. 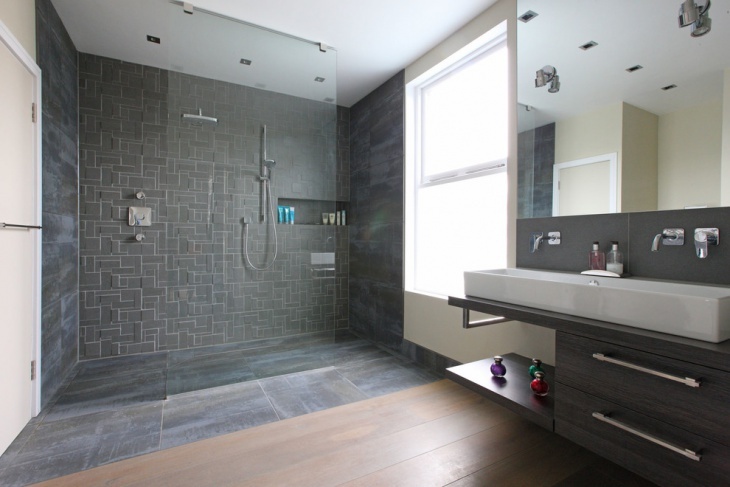 Let’s present some shower designs that are both trendy and self cleaning! That said, it is necessary that you understand the finer details of construction to give a longer life to your bathroom. 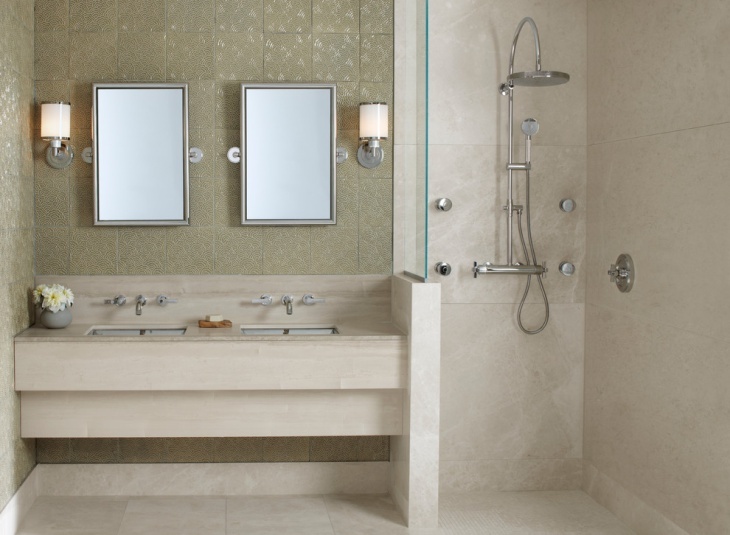 Open showers have generally been associated with big bathrooms. 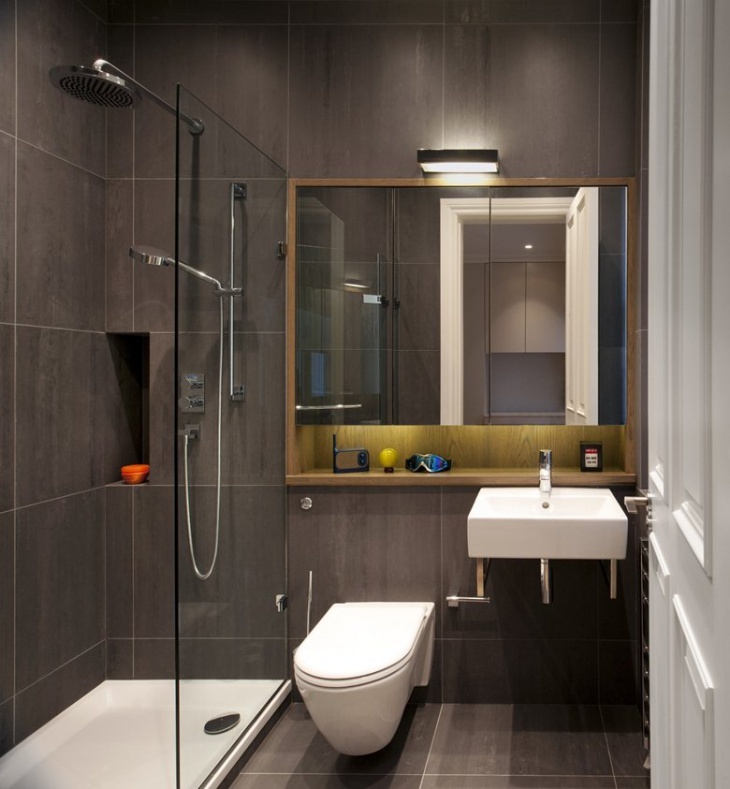 However, you can also choose to have it in your smaller bathroom space. 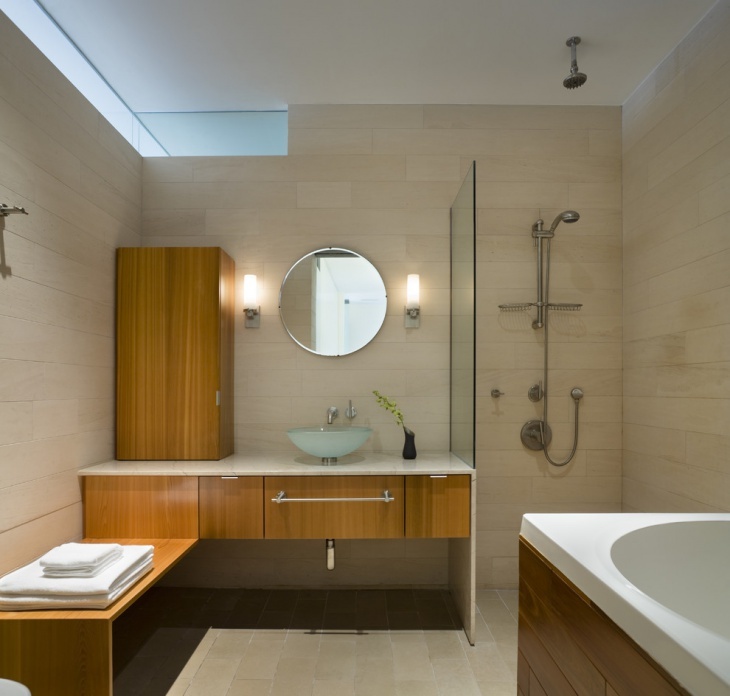 Separated by a glass wall on one side, these open showers are advisably constructed at one corner of the bathroom. With slanting flooring the water management is taken care of. However, you need to ensure that excitement doesn’t ruin the walls too much! It’s okay as long as you are showering yourself or another person! 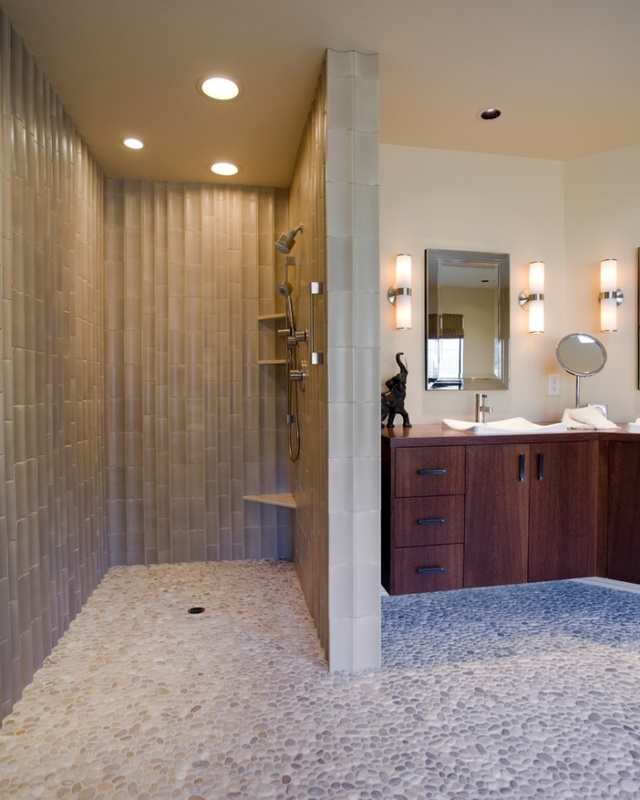 In this example, the architect has been able to create an amazingly charming and cozy space for showers. 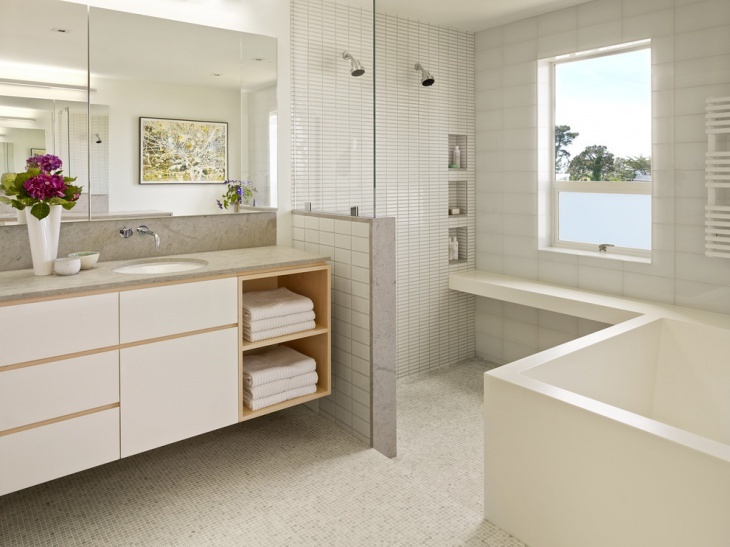 The arrangement of the sink walls and the small glass window itself acts as a barricade to save the rest of the bathroom from splashed and the risks associated with wet floors. This design is not recommended if you have kids to use this same bathroom. There’s no limit to how wild things like a bath can get! This is perfect for young couples looking for a private space inside their own property. Here, the bathroom doesn’t come with a ceiling but has enough foliage to make it an adventurous experience. This is again an example of delicate privacy created by an open ceiling, open base half and a transparent barricade for the rest of the area. Apart from being functional, this also looks a notch exotic, compared to simple glass wall designs. Design by : Jack 'N Tool Box, Inc. 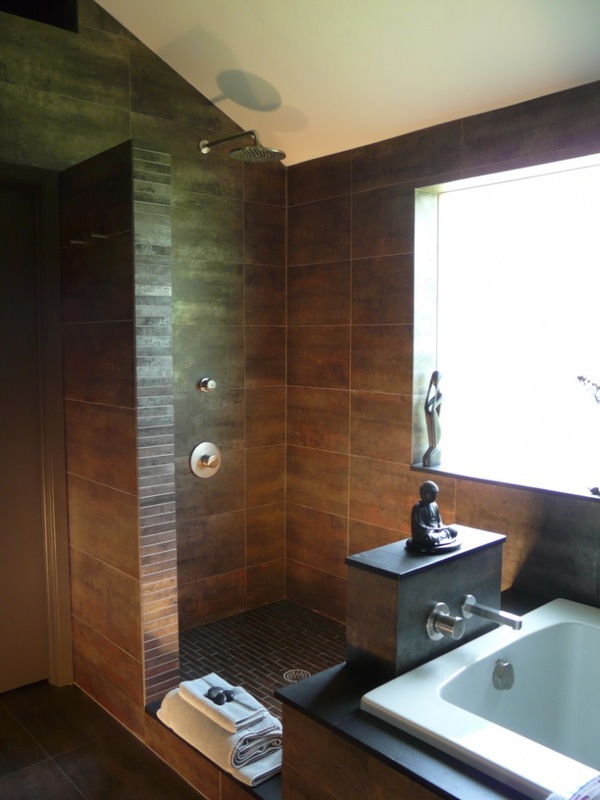 The nature of tiling is very important when we are talking about an open shower design. They need to be resistant, safe, durable and also aesthetically pleasing. 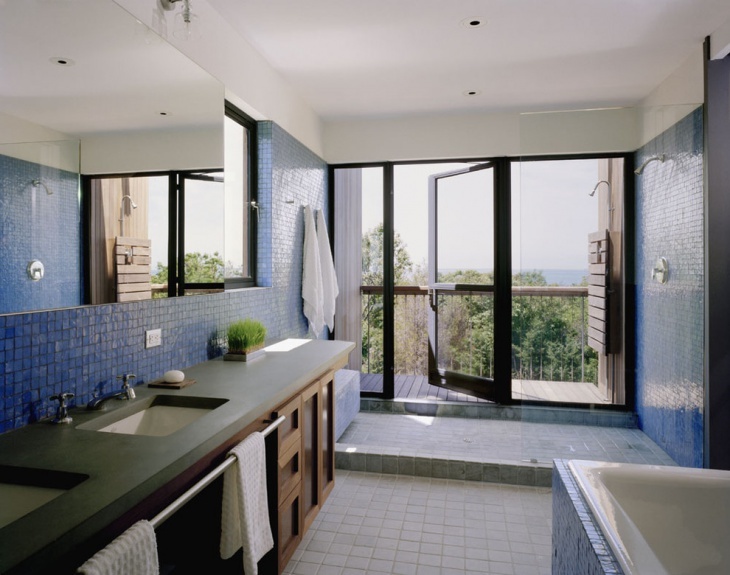 In this case, the architect has used tiles of different sizes but of uniform color o create a vibrant space. 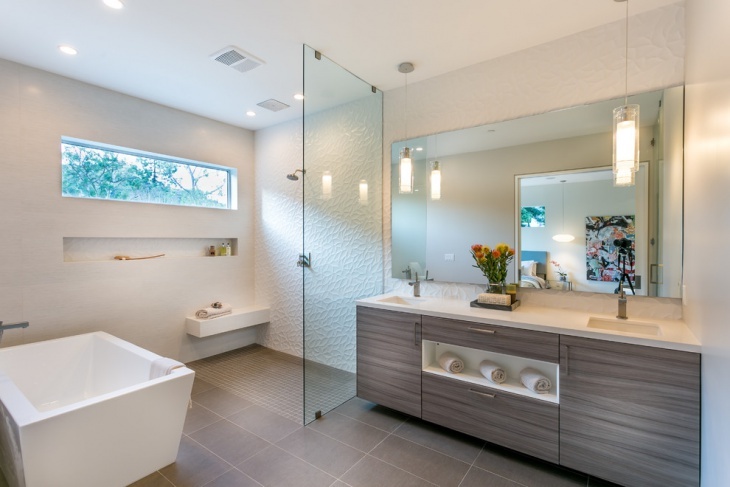 This is a perfect example of how you can have both a bath tub and an open shower integrated into a single space. Enjoy your wine and private conversations in this ideally designed space. 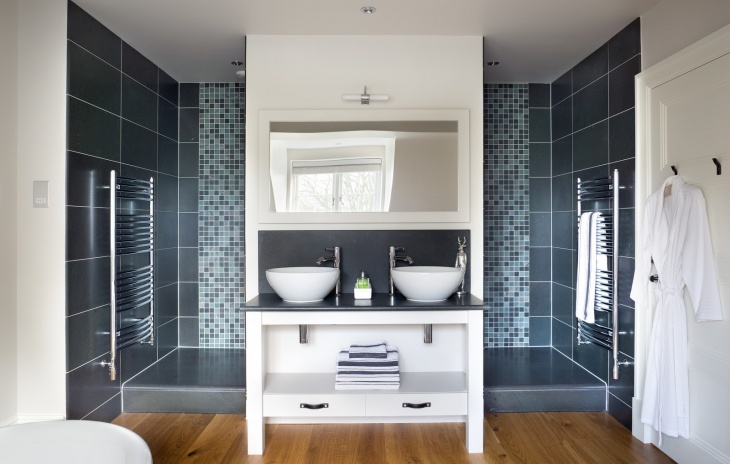 Ideal for a small bathroom, this design keeps things simple yet highly functional. 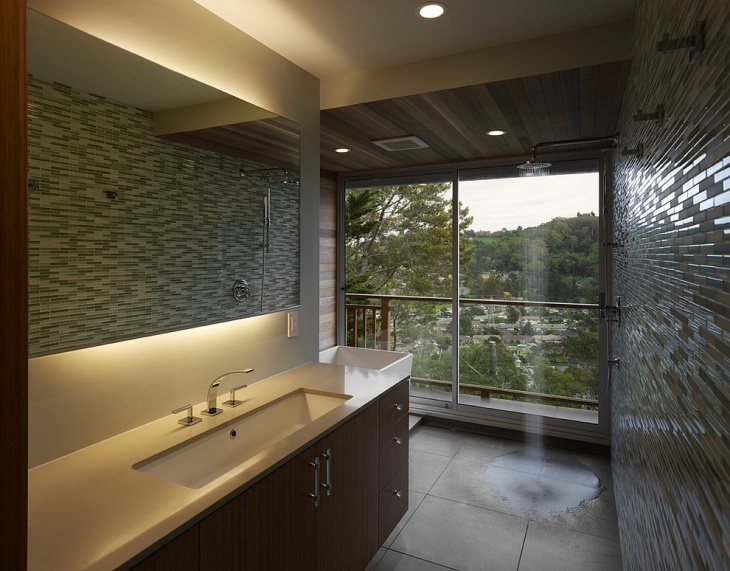 The walk in shower uses a glass door to separate the shower area functionally but keep it visually open. 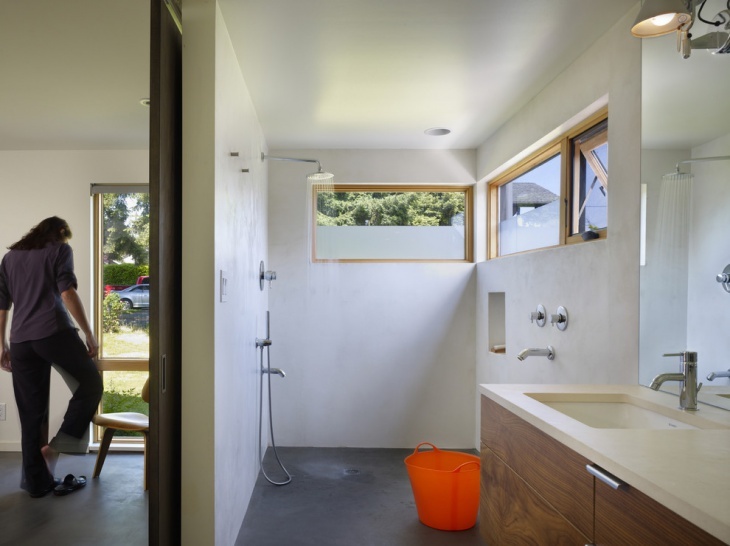 The half raised wall here facilitates easy maintenance and saves the rest of the bathroom from splashes. However, the glass wall on the mat side is set with a highly absorbent carpet for you to step out dry. 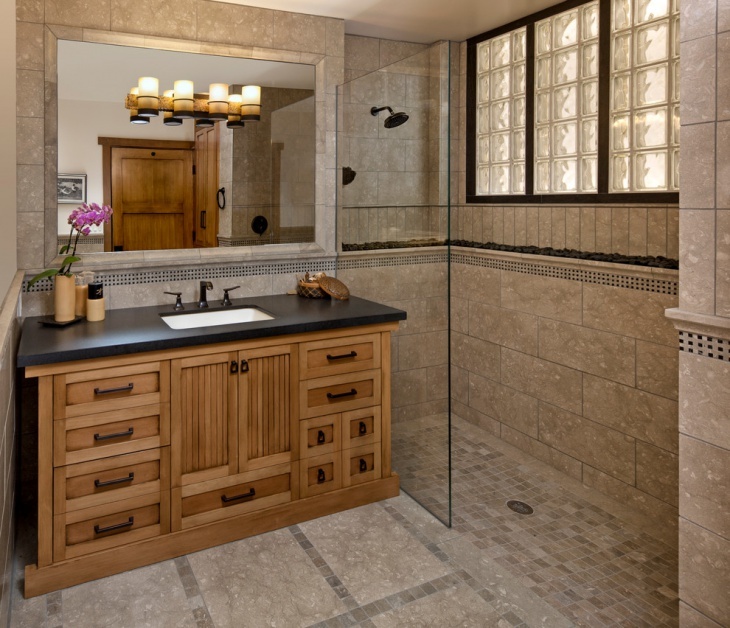 We hope you have found what you had come looking for and are inspired enough to plan your own open shower. 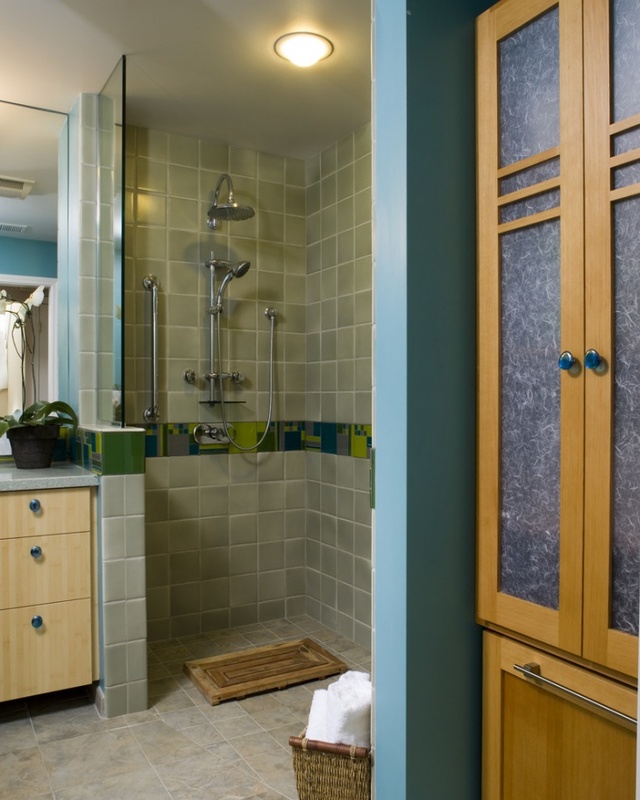 Just remember that the excitement of a completely open shower shouldn’t neglect the need for safety precautions and maintenance ease. Have a good day!